← Pageant Stage Troubles? WATCH THIS! Looks like Gil’s back in Springfield. He returned to Springfield late last week, naturally with another ‘deal” for us. What’s the latest gimmick he’s peddling? 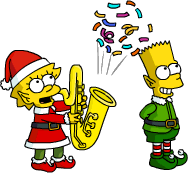 Well this time around he’s paying us a visit from Christmas Past with Young Marge! So let’s break down the details of this latest offer and determine if you should spend your donuts to bring this independent girl to Springfield…. Gil: Tis’ the season of blessings and also regrets, and oh boy does Ol’ Gil have regrets! So many regrets that The Ghost of Christmas Past visits me every year, but this time around he made me a special deal. He’ll stop visiting me, and in exchange I can offer you special deals on blast from the past characters! And boy do I have the gal for you – Young Marge! Gil: If I could afford it I’d give you a stocking full of coal! But if i had stockings full of coal I’d be burning it for warmth. Gil: Thanks pal! 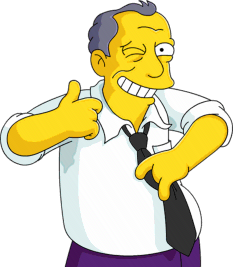 It’ll be a very merry Christmas for Ol’ Gil. -The Roller Rink has a fairly large footprint, which can be difficult to fit into tight quarters. Pull the trigger. It’s Young Marge, perfect match for Teenage Homer. She’ll help with the remaining acts of the event and you can’t get more classic than this. If you’re only going to buy 1 premium character for this event this is the one to buy. She’ll help for all of the remaining acts, and she’s not to much more than the other character combos. (ie Young Barney is 175 donuts) Plus it’s Young Marge, classic! Of course, in the end, it’s your decision, we can only tell you what we would or wouldn’t do…and as a premium player, I think I’ll be taking this deal. But whatever you decide, just make sure you make your final decision before it leaves our games for good (or for now). Note: If you wait until at least Act 3 to do the questline, and purchase one of those premium characters, there will be a few more tasks not listed here. Full dialogue version of this questline will be up with the rest of the Act 2 Premium questlines. 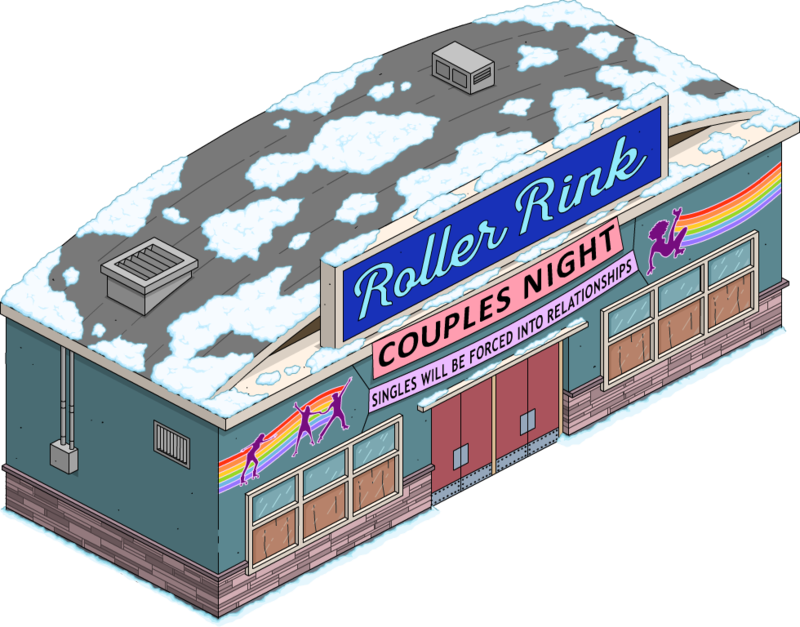 What are your thoughts on Young Marge and the Roller Rink? Will you be spending the donuts to bring it to your Springfield? Did you already? Why or why not? Sound off in the comments below, you know we love hearing from you! 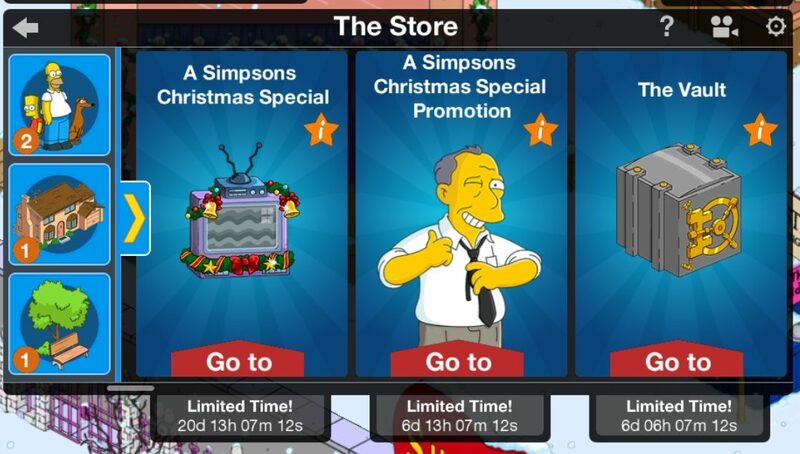 This entry was posted in Buildings, Characters, Gil Deals, Tips and Tricks, Updates and tagged is young marge voiced, Should I Buy Gils Marge Deal, Tapped Out Christmas Event, Tapped Out Tips and Tricks, The Simpsons Tapped Out, TSTO Addicts, TSTO Christmas 2018, TSTO Simpsons Christmas Special, TSTO Tips and Tricks, What does the Roller Rink Do, Will Young Marge Earn Event Currency for the entire event, Young Marge Tasks. Bookmark the permalink. Thanks for this SIB. I was on the fence but this helped me justify pulling the trigger on the purchase. My christmas wish is now for the new young uns to have a visual group task. Like Artie, Homer, and Barney ask Marge to the prom. What is this new ad that shrinks all the content to the left? I was REALLY having a hard time resisting this one. I don’t think I’ve ever taken any of Gil’s deals, as they are usually a rip-off. But this one… I waited for the SIB post to make sure this wasn’t just an impulse buy, but this confirms what my gut said form the first moment I saw her… BUY!!!! I’m still angry that Christmas Fudge isn’t non-caloric…so I am boycotting other cookies…phooey on them all. It’s not non-caloric, just calorie delayed…it doesn’t show up till January, then it hits all at once …Blam! Two sizes larger overnight! I know I should wait until they come back in a mystery back. But it´s young Marge and Barney. I just had to have them right now. I am also going to pick up “young” Abe and Artie. I wonder if “young” Abe will interact with old Abe? Probably not but it would be fun. Thank you Alissa and the entire TSTO team for all your helpful posts. I am freemium and didn’t buy until after reading this. 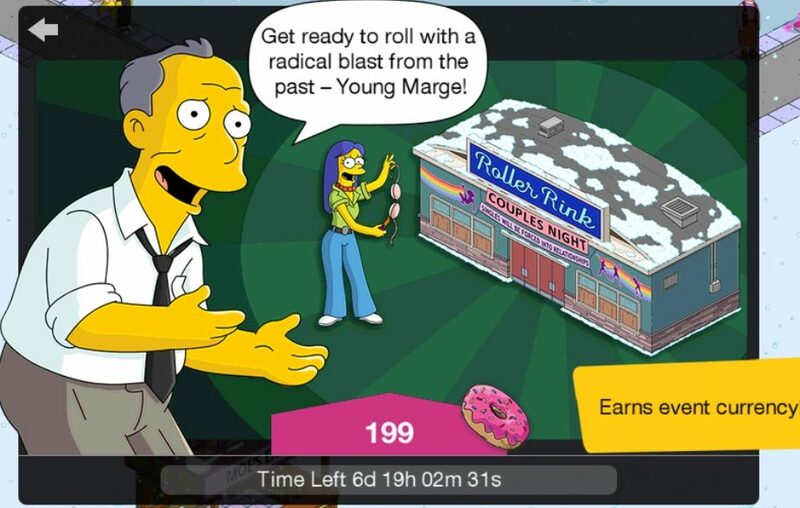 My question is: are most people doing Young Marge’s questline before using her to earn snowballs? I’m wondering if I should try finish Bart”s story quickly and then do her questline after. I’d love to hear people’s advice. Thanks! She and young Barney were a no brainer for me, I usually hum and haw, but not this time. I love Marge’s origin stories, so I made Gil a happy man and pulled the trigger! Having finally reached the point I can spare the donuts on such a causal purchase, I got Young Marge so she and Young Homer could be together. That’s what I get for writing posts at midnight again…. Picked her up same with young Barney and Don with moving the extra help comes in handy. I agree with having teenage Homer young Barney and Marge were pretty much a must so he wasn’t alone in a strange world to him. I already feel sorry for President Lisa and Rockstar Maggie being alone with no other characters from a future Springfield. Does anyone have the popup for the character when you buy it? I tapped too fast and didn’t get to read it. Thanks in advance if someone can post it. Wow the post is already available, thanks! Even f it’s quite pricey, it’s a must buy so i pick her up. Quite sad i didn’t get Young Homer but it’s a cool combo although. Thanks for getting this post up so quick! I bought her after reading what she offered! I also like that you do the deal or no deal poll. Thanks guys! I actual told Gil to go take a hike at first, but that is because I find his dialogue when he is rejected funny. I then ended up purchasing her about ten minutes later because it was Marge. Obvious purchase for KEM farmers. I farm. I passed. Now *if* this was a skin for Marge then this would be an obvious purchase. Canid88 why would you want a skin over a premium character? Marge already has so many premium skins. I love the fact the younger selves are separate characters and this was a instant buy for me. More characters means more cash for farming. I find it disturbing and wrong to have multiple of a character walking around. I don’t mind having a “wardrobe” for a character, having choices is always fun. I only have tennis, witch, and a Mayan so I don’t have to many. EA doesn’t give enough visual tasks and of late the visual tasks are only given to certain hour tasks. (I know there are folks who favor 24 or 8 hour tasks, but there are days I like to use “lesser” used minutes or hour tasks.) So if you can get different skins for a player then tasks don’t get boring and you get more options. I have plenty of characters, but I do look forward to getting new different ones. Getting a double of character that’s younger, older, or in a different outfit doesn’t excite me. First of all 200 donuts for a Gil deal is a decent price compared to the 300 they have been recently so I will more than likely grab this one up. Secondly, I got board with the zoo event and didn’t grind hard enough to get through the last act, thus missing out on teenage Homer. Can we expect him to return during this event? Having young Marge and young Barney without a young Homer seems like heresy. It’s kinda funny how EA does that. Gil deals are, more often than not, 199 donuts. And everyone complains on the price tag. But in August they released Sarah for 300 donuts and people (not just you) now think that’s the new “norm”. Yet everything before Sarah and after has been 199 (or less). I farm and I find the price tag offensive. No deal! I have patience for mystery boxes. Those sweet deals have a special place in my heart. Its all relative. For a newbie, 100 donuts is extravagant. For a KEM farmer, 300 donuts is a drop in the ocean. For someone who just simply likes the character no amount of donuts seem too much. I pulled the trigger for Jesus and Devil for 199 donuts a pop and I’m not much of KEM farmer. End of day, just buy if it makes you happy! I was also thinking about the 300 for scratchy and forgetting that he was not a Gil deal. Either way, young Marge is worth the purchase. However, that doesn’t answer my question. Should we anticipate teenage Homer coming back for Christmas? I have to admit: I was waiting for your opinion. I feel confident now about getting. Thank you for laying it out! Everyone should get one. Feel bad it costs too much for some players. I keep getting booted off the game. Sometimes I get the Bart screen but usually I get the splash screen which lets me right back into the game, unlike when Bart makes you try and try. This has been happening since this event started. I bought some rat traps this morning, buying my usual amount. Got booted off in the middle of collecting donuts and when I got back on, all my chances to collect the remaking donuts was gone. I lost out on over 150 donuts. I’m upset but also not too upset since they are virtually free and can afford, at this time, to lose them. I still have over $1, 260,313,217. I’m upset getting booted off the game every few mins. of play. I’ve been having the same problem since yesterday right after I started buying and selling blood mobiles. Lost about 20 million worth of level up donuts. Now I’m just buying them in small doses at a time. That happened several times to me before I wised up. With the servers being as wonky/dumpy as they are lately, I never buy more than 6 RTTs at a time…then collect…then do 6 more, etc. When I run out of space, I sell them all and start over. It’s not like losing the game cash is really that much of an issue anymore, but it’s really irritating to get dumped every five minutes when you’re farming. Yep. Gotta throttle XP collection, or risk losing a lot of bonut rounds. Seems to be the only workaround right now. I bought her as I have the donuts and who knows when she may return. unfortunately I don’t see myself buying young Barney as he has no bonus or building attached . Young Barney comes with a building…the ice fishing hut, which looks pretty decent imo. ah I thought it’s just a decoration , if it’s a building that generates income then I may pick him up , because it’s Barney and part of his questline has him interacting with Young Marge I have read. Expecting a hefty 300 donuts price, I was pleasantly surprised with this deal. Thanks Gil!